Nasheema Fortuin and Caleb Maromedze work at our Strand store. 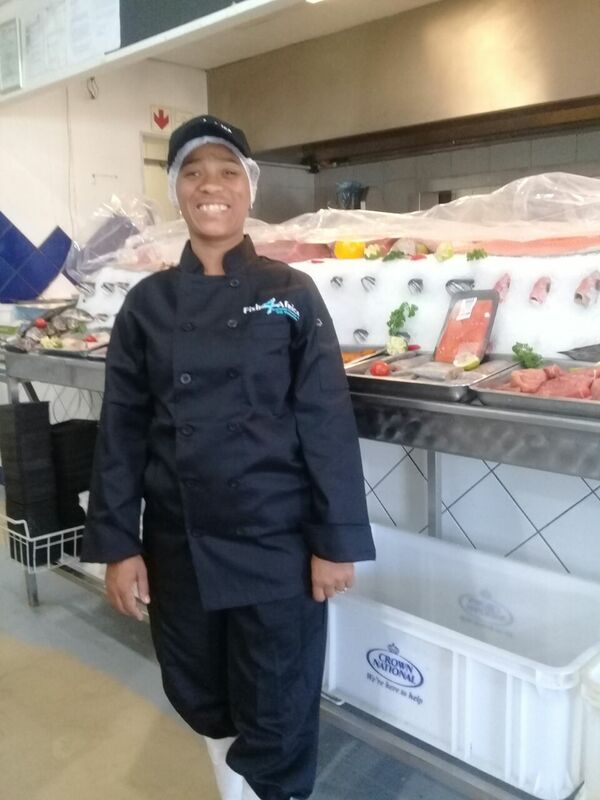 Discover more about their favourite things related to fish and why they believe Fish4Africa is a leading fresh fish and seafood supplier. 2. How did you get into commercial fishing? N: I was previously employed by Sharkex as a fish filleter. C: I started with Fish4Africa at their Woodstock store. C: The filleting and giving great customer service. I take pride in my work. 4. What is your favourite fish and why? N: Snoek as it’s very versatile. You can braai, fry or grill it. C: My favourite is Silver fish. I love the bones. 5. What do you think is the best way to cook fish? N: I would say the best way is to bake or grill it. C: To steam with green peppers and to eat with potatoes. N: My favourite fish dish is pickled fish. C: My favourite is fried snoek and chips. 7. What do you do when you’re not working? N: I am maintaining my home and looking after my children. C: I like to relax and have a few beers. 8. Why do you think fish is an important food source? N: Fish contains all the natural resources our bodies require. C: Fish contains all natural products which don’t have preservatives. 9. What do you get asked most by customers? C: How fresh is the fish and where was the fish caught. N: The customer service that I provide, making a customer smile and asking customers for feedback to various recipes I recommended to them. C: When I can satisfy any customer with a great customer service. N: I think they have the right slogan as they always deliver on this – anything fresher is still swimming. C: Because it is such a well established business and it is so well known by everyone.